Who did this?? And more importantly, why is his/her spelling so terrible!? As expected, UVA lost to Virginia Tech this afternoon. I guess I can't be too upset, since we haven't beaten them a single time since I've been at UVA... and it's been six years now. Luckily, there have been reports that the school might try to buy out the remaining $4 million of Al Groh's contract. The only thing more ridiculous than Al Groh's recent performance on the football field is how much food Titan has managed to eat today. This afternoon, my mom put him outside on the porch, not realizing that she had also left the entire Nanjing saltwater duck that she and her friends had made out there to cool. Minutes later, the entire duck was gone. Then there's the issue of the blueberry muffins he stole off the counter. Little does he know, we're just fattening him up so we can cook him for dinner tonight! Just kidding, my family doesn't eat dogs. Or do we...? In all my years, I've never participated in the Black Friday madness. I know, it's surprising, considering how much of a gadget geek I am. But there's a first for everything, and this morning I headed out to the Tanger Outlet Center in Nags Head to get some new clothes. Specifically, I needed more clothes that are appropriate for the hospital. I have a ton of graphic t-shirts with ridiculous sayings like "I Saw Uranus" and even more free shirts from my undergrad days, but I don't have nearly enough dress shirts and slacks. Also, as my fellow jeans-every-day-wearers will understand, I have worn through (pun intended!) the pair of jeans that I wear every single day. What better time to get new ones than this beautiful yet windy day in the Outer Banks? And I'm not kidding when I say it's windy. Last night, the wind was howling so loudly that Titan freaked out and crawled into bed with me. Aww, so precious! 4. My cell phone works again! My parents' friend fixed it by taking the entire thing apart and drying it out using 91% isopropyl alcohol. 5. Hot pot for lunch and turkey for dinner! Could this be the best Thanksgiving of all time? Yes, it could. See that? See how I took the word "Thanksgiving" and switched it around to make the action phrase "Giving Thanks"? I know, I know, I'm nothing short of a word wizard. So, I guess it's time to give thanks for all of the things I forgot to mention last year. 1. God. Because, you know, He's a pretty cool guy. The whole creating the universe and loving us enough to die for our sins... hats off to you, God. Hats off to you. 2. Family. Because my parents did a pretty darn good job of raising me, if I do say so myself. Even if my mom accidentally washed my shorts with my phone still in the pocket earlier. By the way, I need your numbers. 3. Friends. Because I love all 1,489 of you, according to Facebook. And because you bring me endless joy and make sure that my life never has a boring moment. And because you read my blog, which is the only way in which I quantify my worth in this world. Also, my thoughts and prayers go out to the family of my friend and medical school classmate John Jones, who passed away this morning after being stuck inside a cave in Utah for nearly 28 hours. You will be greatly missed. We arrived at our beach house in Duck earlier this evening, and the trip here was nothing short of a nightmare. I know that I had said that Titan acted like nothing had happened after the car accident yesterday, but his behavior in the car today would suggest otherwise. He was flipping out the entire ride and didn't sit still for a second, crawling all over me in the backseat. Nonetheless, we arrived at the Outer Banks safely, as did the rest of the families. And, in true Chinese style, we all brought so much food that it won't all fit in the fridge. There's food piled all around the living room, too. In other words, I'm in heaven. To top it all off, we also have a hot pot and a karaoke machine. This is going to be a very interesting Thanksgiving weekend indeed. And no, I don't mean "For the win!" I came back to Richmond this afternoon so I could make it to Tina's pre-Thanksgiving potluck, but my plans were thwarted when I got in a car accident. Thankfully, I'm completely unhurt, and the accident wasn't my fault (obviously, since everything I do is with purpose... I don't do "accidents"), but Carmen is not doing so well. When I pulled over, I saw that her entire front right side was smashed up, and there was fluid leaking out of her front. I'm going to optimistically think that it was windshield wiper fluid, but in reality it was most likely radiator fluid. Womp womp. Sadly, Carmen had to be towed, and I was a little shaken up, so my dad came to pick me up and take me home. Titan, on the other hand, survived his first accident relatively unscathed and acts like nothing at all has happened. What a resilient little chum! Deviled eggs are one of my favorite fudz of all time. OF ALL TIME! So when Tina had a potluck last week, it only made sense that I would decide to bring some deviled eggs to share. Well, I ended up missing that potluck thanks to my flu, but then my other Asian friend Tina decided to have a potluck in Richmond tonight. How coincidental/fortuitous! Well, let's just say my batch of deviled eggs did NOT turn out the way I wanted them to. I think they had too much salt and not enough mayonnaise in them. Wherever I went wrong in the recipe, suffice it to say that they were not presentable and are now residing happily in the trash can. Guess I'll just have to stop by Ukrop's* on my way to Tina's tonight. *For those of you who aren't from Richmond, Ukrop's is like Harris Teeter... but better. Highlander. I mean, Pokemon Master. I stayed up really late (I'm too embarrassed to admit how late) last night playing Pokemon Yellow, and I finally beat the game! And by that I mean, I collected all the gym badges and defeated the Elite Four as well as my arch-nemesis Gary, making me indisputably the best Pokemon trainer of all time. OF ALL TIME! Now all that's left is to go around and catch all 150 Pokemon. Ugh, I can already sense that I won't be doing any work over Thanksgiving break. Once, when I was a little kid, my parents took me to Monument Avenue for the annual Easter on Parade event. While we were standing in front of one of the booths, a random girl picked up a brick and threw it at me, hitting my head. We never attended Easter on Parade again. This is one of the most beautiful things I've ever seen in my entire life. In typical Sam style, my intentions of doing work and learning lots of material were thwarted by excuses to have fun. Last night, Sam and Lindsay came into town, and we went to the Chamber Singers concert, Music of American Composers. The performance was incredible, but it just made me mad, because we never got to sing songs that cool when I was in the group, and we never had an audience that large, either. After the post-concert party, Sam and I convinced Professor Slon to come out to late night with us at IHOP, just for old time's sake. I also just got back from watching Speed Racer with Richie and Nate, and I must say, in spite of the dismal reviews it received, it has to be one of the coolest movies of all time. Start with fast cars, add some sweet special effects, throw in a dash of hand-to-hand combat, and mix it all together in a cotton candy-colored backdrop. Sounds like a recipe for success to me! And here's another reason why you shouldn't smoke. I'm happy to report that my fever broke last night, and I'm feeling a lot better. Better enough, in fact, to attend today's Microbiology lectures. Unfortunately, I could be contagious up to 24 hours after my fever went away, so I thought it would be wise to wear a mask to class. This earned me quite a few nicknames: Unabomber, SARS Boy, and my favorite, Snake Eyes. I like to think that I could destroy you with my killer ninja skills AND my killer viral infection. 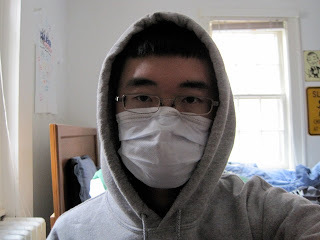 It seems as though the H1N1 virus has struck me at last. I knew this day would come, although I prayed that it wouldn't. My fever is actually on the way down now; it peaked at 101.0°F and now it's down to 99.7°F. But I know I'm still sick because I have no appetite whatsoever... and that NEVER happens when I'm healthy. Hopefully I'll be back on my feet soon, but at least now I have an excuse to do nothing all day, whereas I had no excuse this past weekend to be as unproductive as I turned out to be. The deep cough I've had for the past two days hasn't gotten any better, and I started getting the chills this evening, so I bought a thermometer from CVS so I could take my temperature. I'm running a low fever at 99.8°F, so I've decided to go to Student Health tomorrow. I'm not exactly sure what they'll do for me: last time I went in with a cough, the health care provider asked me if I had been taking cough medicine. I replied no, and then she asked me, "If you don't take cough medicine, how do you expect your cough to get better?" EDIT: I'm now at 100.1°F. Sigh. Titan and I competed in the Pack It Out Canine 5K at Walnut Creek yesterday, and although we came short of my goal of winning the race, we did come in third in the men's category, so I'm pretty pleased. Blake, the guy who had been winning all of the previous races, actually came in second to another newbie to the canine 5k circuit. I kind of felt bad that he didn't get to win all four races, but I guess as they say, you win some; you lose some. For some odd reason, they didn't tell us our times, so I'm not exactly sure how long it took me to run the 5K. I imagine my time wasn't great, though; there were several places where I slipped on the wet leaves and nearly fell. As soon as they post our times and our pictures online, I'll be sure to share them. For the time being, I'll just have to enjoy the eco-friendly shopping bag from Puma(!?!?) that I won. I'l give you one guess as to what this picture refers to. If you said, "The OASIS system used by the UVA School of Medicine to allow students to enter their preferences for third year rotations," then you're right (and probably one of my classmates)! 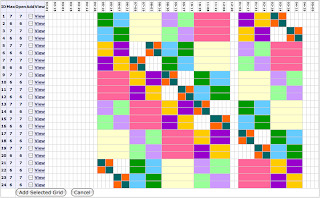 Each row in the grid is a different block of rotations that you can be on, and each of the colors stands for a different specialty. For example, green is internal medicine, purple is neurology, and so on and so forth. Read on if you care to hear about my dog's bowel movements. I let Titan out this morning like I always do before I go to school. He did his usual routine of peeing and pooping, so I was extremely surprised this evening when I came home and found that Titan had pooped in the house. It had been a long time since he'd done that, and it wasn't extremely diarrhetic, so it's not like he was sick or anything. I shrugged it off, cleaned it up, and went to the aforementioned Taste of Charlottesville. When I returned home an hour and a half later, I was shocked to discover that he had pooped in the house AGAIN! Figuring he'd gotten it all out of his system, I went downstairs to get his dinner out of his food bag, which I found completely open. Then I put the pieces together: during the day, Titan must have broken into the dog food and ate himself silly, which explains both the copious amount of poop as well as his current lethargic state. I decided to let him out one more time, and surprise, surprise: he pooped AGAIN. Four times in one day, twice inside the house. 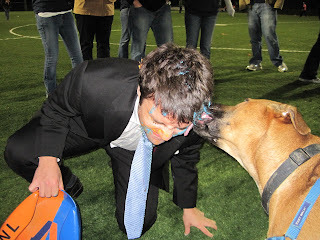 I think it's funny that while I was gorging myself at Alumni Hall, Titan had been gorging himself at home. He truly is his owner's dog. Except I don't usually poop on my living room floor. I do it in my diapers. Now the dog food is sealed with a giant chip clip, so hopefully Titan's rampant defecation will be brought under control. Nosheen, Rohan, and I went to the 12th annual Taste of Charlottesville at Alumni Hall this evening, featuring food from 16 local restaurants. Some of my favorite samples were the Thai salad from Zazus, the steak fajitas from Baja Bean Co., and the pumpkin bisque soup from L'Etoile. I really wish I had a camcorder to document the sheer number of people descending upon each booth. It was like watching a group of piranha-locust hybrids in human costumes whose only thought was to consume everything in sight. My name is Tina and I am a giant poopiehead. BAHAHA! Okay, fine, it's actually me, Sam. But trust me, that is a direct quote. I would never lie to you. Please disregard anything that may look a little weird in the site's appearance over the next week or so. I'm designing a new layout for Sam, and I'll have to move a few things around in the process. Feel free to e-mail or call Sam with any complaints you may have. Thank you. I just received a letter in the mail from Chase notifying me that, upon further review of my account activity, they decided to lower my monthly credit limit to $7500. I mean, it only makes sense. Even with all of the extra charges I put on it to purchase items for medical school events, I don't think I've ever even come close to spending the $15,000 per month they originally decided to give me. Ah, you crazy financial service firms with your crazy schemes and your controlling of the economy that I don't really understand because I still think that the stock market is a figment of somebody's imagination because how do you trade things for money that are just in computers and not really seeing the money and prices go up and down plus the whole yelling on the floor why do you still do that okay I don't know what I'm saying anymore so I'll stop. We had a lecture on Eating Disorders in Psychiatry today, and the more we talked about them, the hungrier I became. Until I finally gave in and started eating my lunch during class. And that's when I realized that I might actually have binge-eating disorder. Our second lecture was on Somatoform Disorders. And that's when I realized that I don't have binge-eating disorder, I just have hypochondriasis, or "the idea that one has a serious disease based on the person's misinterpretation of bodily symptoms or bodily functions." What a great day of learning! This weekend, several University Singers alumni came back to Charlottesville to hear the group perform the Duruflé Requiem. Sam and Leslie stayed over at my house, which unfortunately meant that they had to sleep on the two ratty couches in our living room. Nonetheless, we made the most out of the weekend and managed to find two spectacular deals. First, we went to Buddhist with Mary Virginia for dinner (wait, they serve FOOD there??). Somehow, the steak and potatoes only cost $6. The price seemed unreasonably cheap to me, but why ask questions when you can just order the steak and eat it? Second, we went to the White Spot for Gusburgers at 1:30am, before the rush when bars close. 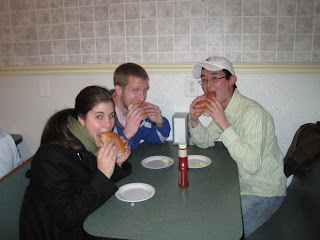 Sadly, Leslie and I were missing Garrett, the third member of our Gusburger triumvirate, so Sam nobly took his place. Perhaps the best part of the night was when I said that I would regret this decision in the morning, prompting the girl in front of me to turn around, punch me in the chest, and say, "TAKE THAT BACK! THIS IS THE BEST DECISION YOU HAVE EVER MADE!" Last night we held the third annual Bedpan Bowl between the UVA School of Medicine first years and second years. After a very close and exciting game, the second years ended up clenching the victory in overtime. Liz busted out cupcakes with orange and blue frosting in celebration, and of course, a great deal of it ended up on Jon, our team manager. And thus, the first picture taken with my new camera was born. I know, I know, this is the fourth point and shoot camera I've owned in the past year. But after the lens of my Samsung SL620 decided to randomly poop out on me in the middle of the U2 concert, I had to trade it in for a new one. I decided without hesitation to go back to the Canon Powershot SD 1200 IS. Ah, the good old Powershot series. You were always a friend when I needed you the most. After what was perhaps one of the worst lectures in the history of Pathology, I opted to skip both Pharmacology lectures and instead take a long, nice nap in the library. At 9am. Is that normal? Anyway, what was long and nice for me was apparently not so nice for everybody else. When I nap at the library (yes, this is a common practice), I usually go to the quiet section and pull two sofa chairs together, facing each other, so I can sleep on both of them. Well, somehow while I was asleep this morning, the chairs slid apart and I was sort of hanging on between both of them in some weird, contorted position. And when I'm in a weird, contorted position is when I snore. Loudly. Apparently for five minutes. While the other library patrons stare at me with eyes of fury. And while my friends, several of whom are sitting within ten feet of me, laugh to themselves instead of waking me up. 1. I got my first papercut of the winter season today. And from my POM booklet, no less. You cruel thing! 2. We turned on the heat to our house today. I can't wait for exorbitantly high utilities bills. 3. Oh, and I guess it's also cold outside. Maybe that has something to do with it. My new Practice of Medicine small group met for the first time this afternoon, and aside from the fact that we went half an hour over our allotted time, I'd say that it set a great precedent for the rest of the block. Why? Because Dwight showed up with a pumpkin pie, Halloween-themed cookies, and a bag of apples. Okay, so the apples were kind of random, but so delicious AND nutritious! We've decided to bring food each week from here on out, and Kathleen is up next with her homemade banana bread. This block's gonna be a good block, this block's gonna be a good block, this block's gonna be a GOOD GOOD block. 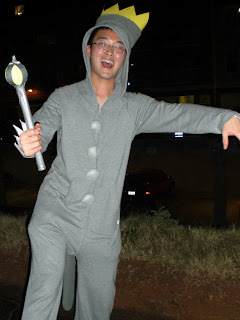 Last night, I dressed up as Max from Where the Wild Things Are for the annual VMed Halloween Party. I guess a more appropriate name for the event is Trial by Fire for the New First Year Social Chairs. Just as with Nosheen and myself last year, it was Sonny and Christina's first time planning a schoolwide social event. I must say, they did an amazing job, especially with the chicken wings and nuggets. Now that they've spoiled me, I'm going to expect delicious food platters at every medical school party I attend. It was also nice to go to a party where I didn't have to be worried about any logistics whatsoever. For once, I could just sit back, hang out with my friends, and eat chicken. Did I already mention that I was really glad they had wings and nuggets at the party? Because I was. Welp, having wasted an entire week on Halloween activities from costume sewing to pumpkin carving to nature hiking to beer tasting to movie watching to general merrymaking, I suppose it's time to finally buckle down and learn how to read those blasted EKGs.